Antiphon: Lord Jesus! in union with that love which drew Thee down upon earth, and caused Thee to fulfill the work of our Redemption, I offer Thee this prayer. 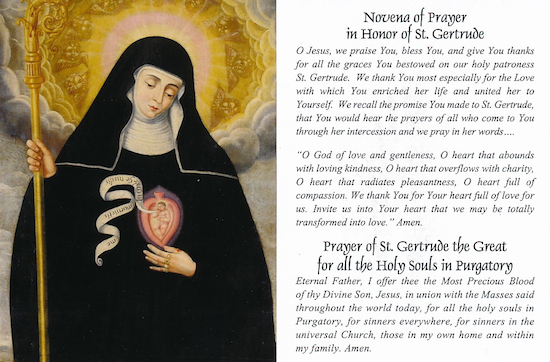 O Lord Jesus, by the love Thou didst bear to the virginal heart of Saint Gertrude, and by which Thou hast promised that no sinner, who would honor and love her, should die a sudden and unprovided death: grant me, I beseech Thee, this grace, and let me so love Thee, and repent of my sins, that with faith and confidence I may expect a happy death. O God, Who in the heart of the holy virgin Gertrude didst provide for Thyself a pleasing abode: through her merits, do Thou cleanse from our hearts every stain of sin, and grant that we may enjoy fellowship with her for evermore. Through Our Lord Jesus Christ Thy Son, Who liveth and reigneth with Thee and the Holy Ghost, one God, world without end. Amen.